Fall is a beautiful time of year to enjoy the outdoors before it gets too cold, and with Halloween and the holidays around the corner, it’s important to stay active. With all that the season brings, we also want to have fun while we are active, so we are highlighting 4 fun fall activities to keep you moving and enjoying a healthy lifestyle. Raking leaves is a great way to work up a sweat while enjoying the outdoors and taking care of the yard! You can actually burn an average of 330 calories by raking or doing similar yard work for 60 minutes! So grab a friend, family member or even your pet, and play in the yard! Navigate a corn maze in your local town or at a fall festival. It's a great way to walk around and enjoy the company of others. Try this "Pump It Up Pumpkin" workout. You get to use a pumpkin in place of a weight or medicine ball. Not only is it a sculpting full body workout, but it's fun too! 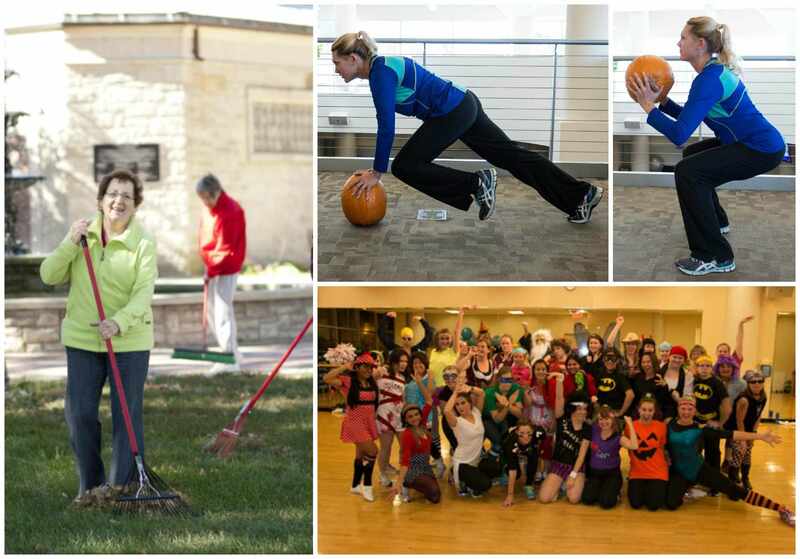 Sign up for Halloween Zumba at the DAHLC on Friday, October 30th from 5:30-6:15pm. This is another wonderful way to have fun in motion while showing off your creative style! Costumes are encouraged. We hope you make memories and enjoy lots of laughs while staying healthy with these fun activities.